As we lovingly leave our trio of Seekonk restaurants behind, we now focus our attention to a new city - New Bedford. New Bedford has a ton of restaurants scattered around the busy city and it will be hard choosing just which three we want to feature. 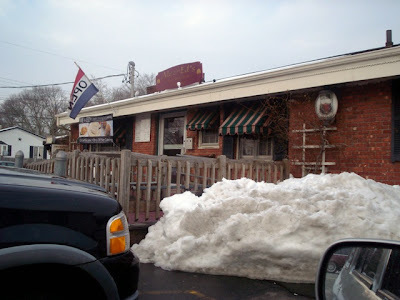 But we decided to start with a restaurant we visited before but had never "officially" reviewed - Me & Ed's. Me & Ed's fools you. It looks like a teeny weeny place from the outside but when you go in, you find yourself in a lovely mid-sized restaurant. Also, there is a parking lot right in front of the building, and this may cause you to drive right by the restaurant. But don't drive by - go in! You'll be glad you did. Me & Ed's has been in business since 1964 and has a huge following. You can't be in business for over 40 years without doing things right. 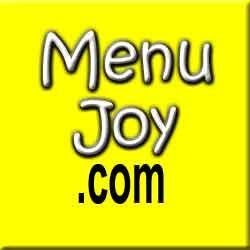 They are a full service, moderately priced, family restaurant that specializes in seafood and Italian favorites. They also have a catering business that offers all their most popular dishes in party platter size. 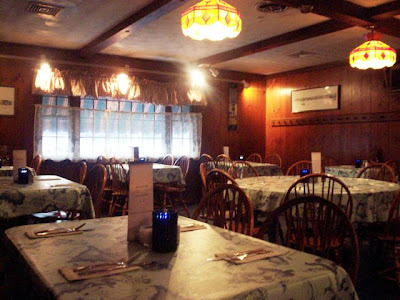 The extensive restaurant menu includes appetizers (stuffed mushroom caps, clams casino and much more), soups and salads, pizzas and subs, Italian fare (lasagna, ravioli, chicken parmigiana, etc. ), meats (steak tips, fillet mignon, ribs, chicken, etc. ), seafood (scrod, shrimp, scallops, salmon, and swordfish) and great combo platters. You certainly won't have any trouble finding something to entice your appetite. Laura and I arrived around 4:30 p.m. which turned out to be a great time - before it got super busy. We were seated immediately and our terrific waiter Dylan came to give us our menus and the specials and take our drink order. He also brought over two iced waters in chubby glass jars (you don't often get iced water anymore unless you ask - we appreciated this). We ordered two Diet Pepsis and studied the menu. It didn't take us long to decide what we wanted. 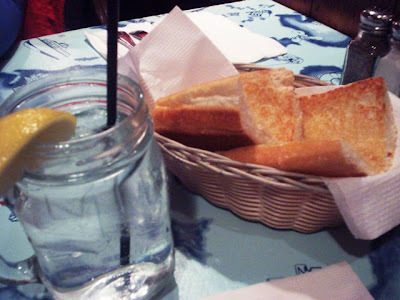 When Dylan returned with our sodas (also in glass jars, so cute), he also dropped off some delicious-looking garlic bread. It was warm, buttery and garlicky, and tasted fantastic. This is something else you also don't usually get without ordering it. Bravo Me & Ed's! Laura decided on one of the night's specials - Portuguese haddock. It was a lovely white fillet covered with peppers, onions, and linguica (Portuguese sausage). She chose as her sides fries and butternut squash. But before she gave her order, she was twisting her lemon into her water and squirted me right in the face. I called her on it and the two of us and Dylan had a good laugh, lol! Later on, she also had trouble squirting her ketchup on her fries and got it on herself instead. I guess Laura has trouble with condiments. Who knew? I decided on the broiled scrod which came with a house salad and my choice of side - spaghetti (big surprise if you know me). 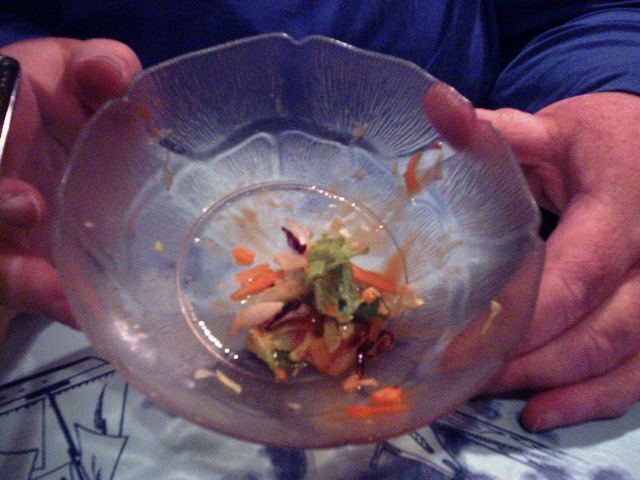 The salad was very fresh and crisp and the French dressing I requested was nicely tangy. It was a nice start to my meal. The scrod was perfection. 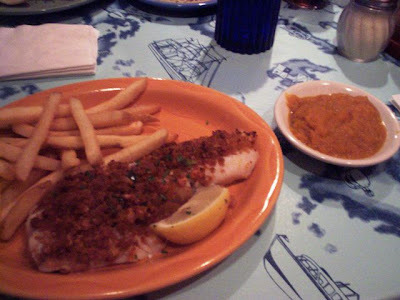 It was a good-sized fillet topped with buttery crumbs and flaked easily with my fork. It was just delicious. I love it when someone really cooks fish correctly. 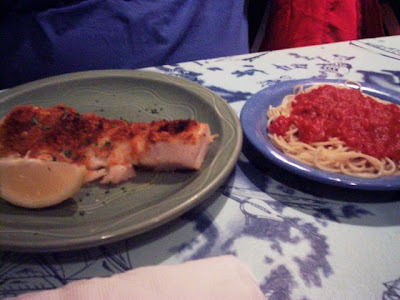 My side of spaghetti with marinara was great (I just wished there was more; I only got about four or five twirls). What was left of my salad after we remembered to take a picture of it. 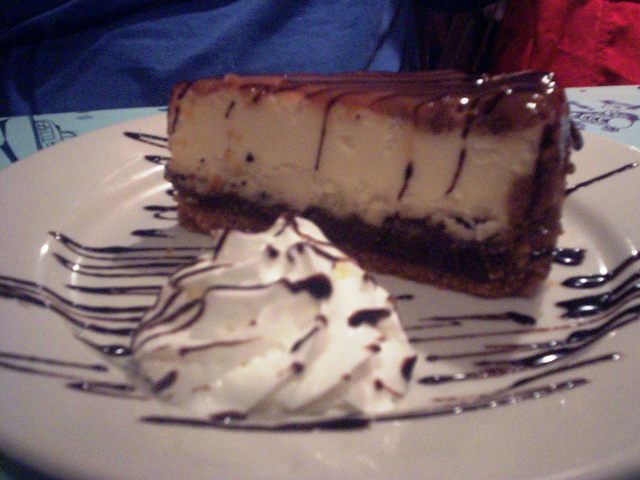 Everything was so good we did something we don't usually do - get dessert. We both decided on a piece of cheesecake. Laura got the creme brulee and I got the turtle (Dylan's fave, we learned). They arrived beautifully presented with mounds of whipped cream along side. We couldn't wait to dig in, but first we each shared a piece of our cake with the other. They were yummy. 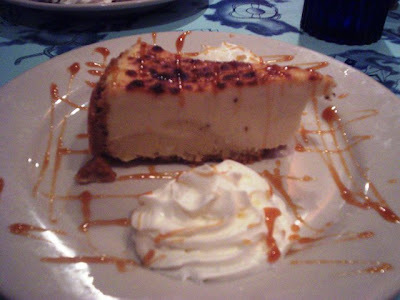 Smooth, cold, creamy and luscious, they were everything you want a cheesecake to be. If fact this whole meal was superb and I'd repeat it verbatim in a minute. We'll definitely be coming back to Me & Ed's to try more of their fabulous menu. After tasting the food I understand why they've been in business so long and are still so popular. Try Me & Ed's, you won't be sorry. With a 20% tip for the terrific Dylan, we left $55 on the table. P.S. - When Dylan left our bill, he also left wet naps (a practice I haven't seen in a long time). It was great because of all the misguided squeezing Laura was doing, she had sticky, icky fingers (like when she was a babe - sigh). Funny bathroom story: The ladies' room is right near the entrance door. When Laura was exiting the ladies', she was met by three women coming in and all turned and looked right into the restroom, lol! The room is very tiny (room for only one), but had it been large enough for another stall, those women may have spied something they shouldn't have. If it were possible, I think Me & Ed's should expand the ladies' room and take over the little area that's just beyond it. Just a thought. Me & Ed's Restaurant is open from 4:30-8 p.m. Tuesday and Wednesday, 11:30 a.m. to 8 p.m. Thursday, 11:30 a.m. to 10 p.m. Friday and Saturday, and 11:30 a.m. to 8 p.m. Sunday. The restaurant is closed on Monday.